There are numerous ways to get free music streaming these days. Here are three tools that rely on YouTube. It’s a sad day for music fans who loved to listen to music from YouTube without the videos. The popular Chrome extension Streamus disappeared from the Chrome Web Store on Tuesday, July 14. Current users of the extension shouldn’t lose functionality, the extension’s developer Sean Anderson told me, as he intends to keep the Streamus database running. Even if Streamus does stop working, have no fear—there are a number of alternatives for getting your streaming fix on. The problem was that Streamus didn’t comply with YouTube’s terms of service, based on emails published by Anderson. Discussions to get Streamus to comply with YouTube’s TOS—including displaying videos, ads, and removing the audio-only mode—were unsuccessful. With Streamus on its way out (for now), here’s how you can you get your music streaming fix without relying on YouTube’s video-centric interface. This simply-designed website turns YouTube into a free music service just like Streamus. The difference is that StreamSquid is not a Chrome extension and it shows the videos in a small player on the right-hand side—presumably that keeps it in YouTube’s good graces. When you first land on the site there are a number of playlists, organized by genre, that you can start listening to right away, such as Rock Classics, Billboard Top 100, and Rdio Most Played Today. There are also thematic Internet “radio stations” that are really just auto-rotating playlists. You can find videos organized into albums from various artists, and if you sign-up for the service via Facebook you can create your own playlists. Whyd is similarly sparse to StreamSquid, with maybe a little more polish. 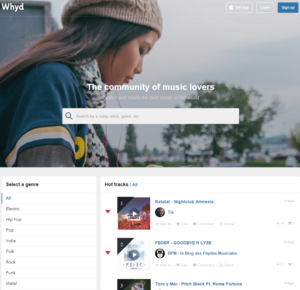 Instead of a bunch of playlists, Whyd starts you off with a long list of more generic genres such as Electro, Hip Hop, and Blues to help you dive in to the YouTube music catalog. You can also just start searching for tunes. If you sign-up for an account on Whyd you get a slightly different experience. To start, you’ll be asked to pick your favorite genres of music. Then it will automatically have you follow (subscribe) to other members, dubbed “music lovers.” Then you’ll be prompted to add an extension to your browser (at least if you use Chrome) to bookmarks songs you like from YouTube and SoundCloud. Finally, you’ll land on a stream or live playlist that includes songs from the people you followed in the first step. There’s also an option to listen to the top tracks on Whyd. If you like Whyd there’s also an iPhone app. Whyd will play each YouTube video, but there is a toggle option to turn off the video and you can also make the video disappear by visiting a different page on the site while the persistent audio player keeps rocking. Considering video display was one of the issues that caused Streamus’ downfall, don’t be surprised if this functionality disappears. The Chromium-based browser Torch for media junkies runs a YouTube-based music service aptly named Torch Music. You don’t need to download the browser to use the service—just visit Torch Music on the web and start listening. 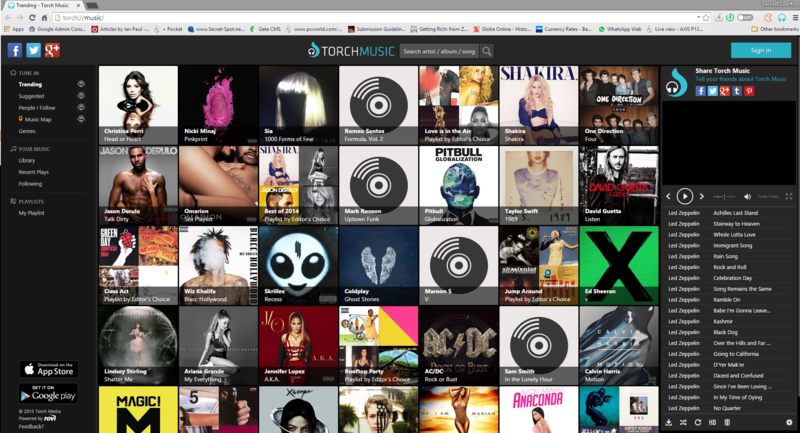 Like the other services, Torch Music is not audio-only and displays each track’s video in a small window. If you don’t like the idea of Torch, StreamSquid, or Whyd, there’s always your typical services that offer free, ad-supported audio streaming, such as Google Play Music, Pandora, and Spotify. Streamus may be down for now, but don’t count it out. Anderson originally planned to return with his Chrome extension as a SoundCloud-friendly service. However, he told me SoundCloud’s terms were even stricter than YouTube’s, making it unlikely he’ll pursue that option. Streamus could one day return as a separate Chrome app, Anderson said.